Interest‐Charge Domestic International Sales Corporation (IC‐DISC) is quite a mouthful, which may be a reason why most people don’t know about this tax incentive. Thousands of businesses are not taking advantage of this tax savings opportunity mainly because they aren’t aware of its benefits. 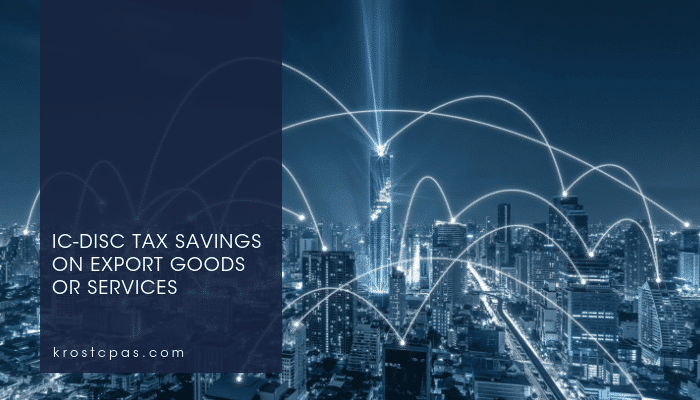 The IC-DISC was originally created by Congress to promote export sales by allowing companies to defer income, with interest charged in the deferred tax. Now, the IC-DISC provides significant and permanent tax savings for producers and distributors of US made products used abroad. In simple terminology, an IC‐DISC is a separate legal entity from the operating entity. • The operating company pays a deductible commission to the IC‐DISC. • IC‐DISC is not taxed on the commission income. • IC‐DISC pays dividends to its shareholders taxed as qualified dividends. Enjoy this and other exclusive content by subscribing to KROST. KROST Quarterly is a digital publication that highlights some of the hot topics in the accounting and finance industry. Issue 1, Volume 2 covers manufacturing trends and news including cybersecurity, tax benefits and incentives, and technological advances in manufacturing.